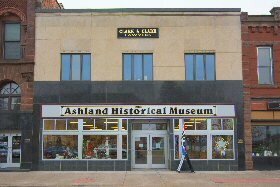 Swing in to the Ashland Historical Society Museum on historic Main Street and browse the gift shop and rotating exhibits and/or check out the historic photo archives and research room all open year-round to share and preserve Ashland’s history! #2: Beaser Piano: The first piano to come to the shores of Lake Superior was built in 1823 or 1824. This Chickering piano arrived in Ashland in 1855 with Martin and Laura Beaser. The Museum is in the process of restoring the piano so that it may be played once again. #3: Then and Now: Showcasing Ashland’s history with our large photograph collection and research room. #4: Exhibits: Displays offer a variety of topics throughout the year including Ashland’s lakefront. and Saturdays June thru mid-October 10 a.m. to 3 p.m.